Home PUBG Tips and Tricks PUBG Mobile 0.12.0 a Huge Update and Leaks ! 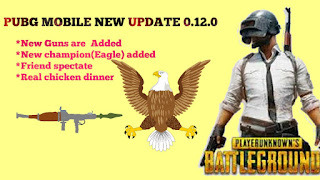 PUBG Mobile 0.12.0 a Huge Update and Leaks ! PUBG Mobile new update 0.12.0 is now available on PUBG Mobile Beta. It is a huge update of PUBG Mobile and a lot of things are added. They added RPG-7 and Explosive Crossbow weapons and RPG and Explosive Crossbow are available only for Event mode. PUBG Mobile 0.12.0 a Huge Update and Leaks! New gun Explosive Crossbow will explode when you shoot. Explosive Crossbow can break the wall and hit the enemy. New zombie event mode namely survives until the rescue arrives. In the new zombie event mode, you can find RPG-7 and Explosive Crossbow weapons. Finally, the biggest update is here, now you can see what your's other friends are doing in the current time on a game. We can see their tiles, kills, and stats through spectating. After winning a match, now you can cook a chicken dinner. It will be huge fun after winning a match. New champions added as an Eagle bird and no need to worry or feel alone while playing a game because of an eagle. An Eagle will be only visible to you and your teammate and the enemies will not able to see your champion ( Eagle). Global PUBG Mobile 0.12.0 update maintenance is on 16th April and an update will roll out on 17 April. All you need is to go to the following Link! and download the PUBG Mobile 0.12.0 Beta Update App.